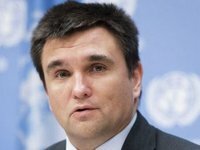 Various options of international sanctions in the Kerch Strait are being considered, including banning Russian ships from calling at some ports from the Sea of Azov and the Black Sea due to Russia's aggression against Ukraine, Ukrainian Foreign Minister Pavlo Klimkin has said. "Sanctions are different. One of the ideas we are talking about is to ban Russian ships from entering some ports from the Sea of Azov or the Black Sea. Or ban some of them. And to limit all possible contacts," he said on the air of the Inter TV Channel. The minister noted that there are many ideas of sanctions against the Russian Federation, and they are not exclusively economic. According to him, the work on preparation of sanctions is underway, but he found it difficult to specify when they will be introduced. He expressed hope that the United States' sanctions against Russia will be strengthened.